Being a Boston sports fan can be overwhelming at times with all four teams contending for a championship almost every year. As if the Red Sox’ playoff run and Patriots’ resurgence weren’t adding enough excitement to your life, the Bruins have now won four in a row and the Celtics’ season/home opener is on Tuesday night at the Garden. The Sox are heading to Houston tied 1-1 after handing the Astros their first loss of the postseason on Sunday night. David Price didn’t pitch well. Four earned runs in four and two-thirds. But it didn’t matter. For the first time in his career, his team won a game that he started in the postseason. He can thank his offense for putting up four runs of their own on 15-game winner Gerrit Cole and three more on the Astros’ bullpen. Mookie Betts, Rafael Devers, and Jackie Bradley Jr. went a combined 5-for-11 with five RBI’s and the Sox came away with a 7-5 win. The bullpen was solid besides Craig Kimbrel, who continues to struggle. He allowed a run in the ninth after scoreless innings from Matt Barnes, Ryan Brasier, and Rick Porcello. Tuesday’s matchup in Houston will feature Dallas Keuchel and Nathan Eovaldi. Eovaldi was mocked by Alex Bregman on Instagram on Monday, so it would be incredibly satisfying to see Bregman go hitless and the Sox get the win. First pitch at 5:09 ET. The Pats have now won three in a row since starting the season 1-2. About 30 minutes after the Sox’ win on Sunday, Stephen Gostkowski nailed a 28-yard field goal to finish off the previously undefeated Chiefs in Foxboro. The defense wasn’t great but there’s no need to be concerned. They just beat a team that was 5-0 and they have a chance to win their fourth in a row this Sunday against the Bears in Chicago. Kickoff at 1 pm ET. The long-awaited 2018-19 Celtics season tips off Tuesday night at 8 pm. It will likely overlap with the end of the Sox game, but not by much. If you thought there was a lot of hype around last year’s season opener, just wait for this. With LeBron in LA, Boston is now the undisputed team to beat in the East. Kyrie Irving (who’s staying, by the way) said a few weeks ago that they’re capable of beating the Warriors in a seven-game series. The Sixers come into the Garden on Tuesday looking to make a statement after losing to the C’s in five games in last year’s Eastern Conference Semifinals. The only problem is that the team they lost to back in May was missing its two best players. Now they’ll have to deal with that same squad plus Kyrie and Gordon Hayward. Good luck. After starting off the season by being embarrassed 7-0 on the Washington Capitals’ banner night, the Bruins have gone on an absolute tear. Their performance has flown under the radar with everything else going on in the city, but they’ve racked up 22 goals over in their four-game winning streak since opening night. David Pastrnak appears to have taken another step forward. The 22 year-old has seven goals and two assists through the first five games. The B’s will look to extend their streak Wednesday night against the Flames in Calgary. There’s no time quite like October, especially when the Sox make a deep run. 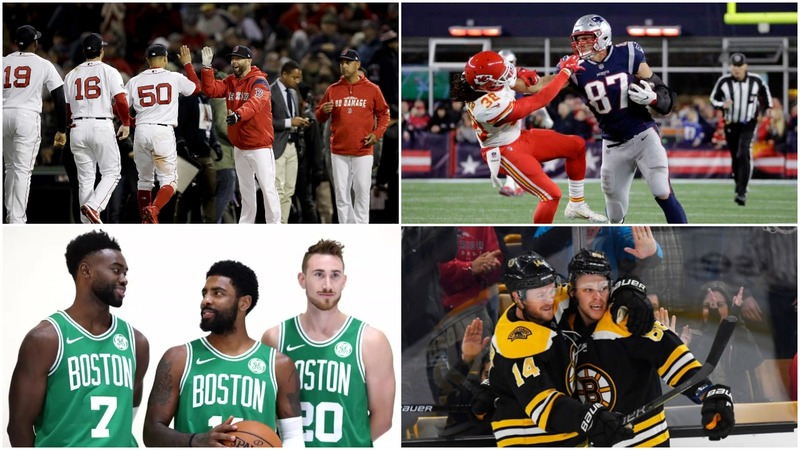 Now that you’re all caught up, sit back (or stand and yell at the TV) and enjoy the type of week that only a 21st century Boston sports fan has the privilege of experiencing.